The Creative Camp provides a much different camping atmosphere than the Main Camp. The Creative Camp is designed for a more rustic experience. 135 of the 200 beds are in screened cabins. Restroom facilities are located in bath houses nearby the screened cabins. 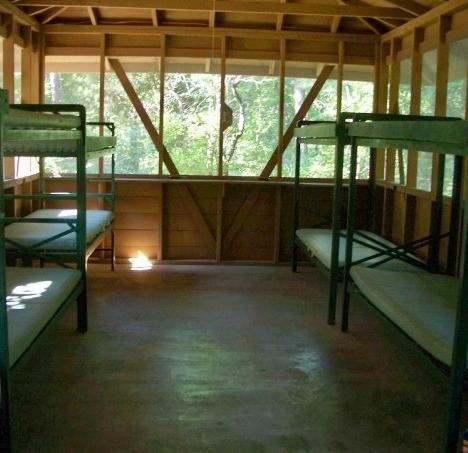 The remaining 65 beds are in cabins that are enclosed and climate controlled. As with the Main Camp, the Creative Camp sits on a private lake and has its own outdoor worship areas. The Director's Cabin is used as the command post for summer camp during the summer months. It has an inviting front porch, a small meeting room and two beds. It also has its own restroom and shower facility. The Director's Cabin is a great place for a group's leader to sleep, or as a private retreat space for an individual. The Long House sleeps 32 people. It houses two bedrooms that each contain 16 bunks. The Long House has a meeting room attached to the back that can seat around 75 people comfortably. Located close to the Dining Hall and recreation field, the Long House is great for a smaller retreat or camp. 13 and 14 are our other enclosed cabins. They sleep 16 people each. They are located across the camp from the Long House, which works well for housing males on one side of the camp and females on the other. They are also a short distance from the bath house. 135 of our beds at the Creative Camp are in screened cabins. These cabins provide a great space for groups that are seeking a more rustic camping experience but are still shielded from the elements. Each cabin has electrical outlets, overhead lighting and ceiling fans in order to add a few conveniences for your stay. Each cabin sleeps 12 people. The Dining Hall is in the center of the Creative Camp. Its large, inviting porch often serves as the natural gathering space for our guests. The Dining Hall can accommodate 100 people comfortably. Seating is at picnic tables. Guests who use the Creative Camp Dining Hall can either choose to have our foodservice staff prepare your meals or, if you so choose, you can prepare your own food. The Creative Camp is also home to an RV Park that can house up to 10 recreational vehicles at one time. Adjacent to the RV Park, the RV Building contains a bathroom and shower, a kitchenette, and air conditioned meeting room. The meeting room can seat up to 50 people comfortably. In addition to these buildings, the Creative Camp has two open air pavilions that can be used as break-out spaces for small groups. There is a large Fire Pit near the Dining Hall that serves as a wonderful worship area for our groups. The fire pit seats 150 people and offers a great view of the lake. In addition to the Fire Pit, the Creative Camp has a small lakeside worship and gathering space. The space provides bench seating for 75 and also overlooks the lake. If technology is needed for worship, there are electrical outlets provided. The Creative Camp has a large recreation field, a volleyball court, basketball court and tetherball court for our guests. Ping pong is also provided. Guests at the Creative Camp are welcome to use the Main Camp's pool and lake during the warmer months. During the summer, transportation to and from the swimming area can be provided by our staff at no extra charge.